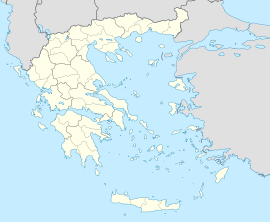 Petroupoli (Greek: Πετρούπολη) is a suburb in the northwastren pairt o Athens Metropolitan Aurie, in Greece. Petroupoli wis pairt o the commonty o Nea Liosia til 1946, when it became a separate commonty. It wis elevatit tae municipality status in 1972. Petroupoli is situatit in the eastren fuithills of the Egaleo muntain, 7 km northwast o Athens city centre. Its main streets (25 March Ave., Anatolikis Romylias St. and Perikleous St.) connect the toun wi Ilion an Peristeri. ASDA (Association for the Development o Wastren Athens) regards Petroupoli as the maist developit wastren suburb o the caipital. The Petra Festival taks place ivery simmer. The aurie's junior fitbaa team is namit Aris Petroupoli. Petroupoli the day incorporates a nummer o private an 15 public kindergartens, 12 primar schuils (11 public an 1 private), 6 public lawer seicontar schuils (gymnasia), 5 public upper seicontar schuils (lyceums) an ane public Technical Seicontar Schuil (EPAL). In this aurie there was once a great tradition of mayors supportit bi the Communist Pairty o Greece (KKE). For many years, the suburb's mayor was Nicolaos Paximadas, supported by the KKE. Follaein his retirement, another candidate endorsed bi KKE, Giorgos Giogos, became mayor o the aurie for the aicht years atween 1994 an 2002. In 2002, candidate Stefanos Vlachos wis electit, endorsed bi baith another left pairty, Synaspismos, an the Panhellenic Socialist Muivement (PASOK). In 2006 elections, Vlachos wis re-electit, earnin mair than 42% o the votes. In the 2010 elections, anither communist mayor, Thomas Kotsambas wis electit efter the aicht-year Vlachos era, makkin Petroupoli the anerly municipality in Greece that haes a mayor supportit bi the Communist Pairty. In the 2014 elections the fowk o Petroupoli electit Vangelis Simos who haes the support o the Communist Pairty an aw.